EMOTIONS - SignOn - Connect. Practice. Retain. 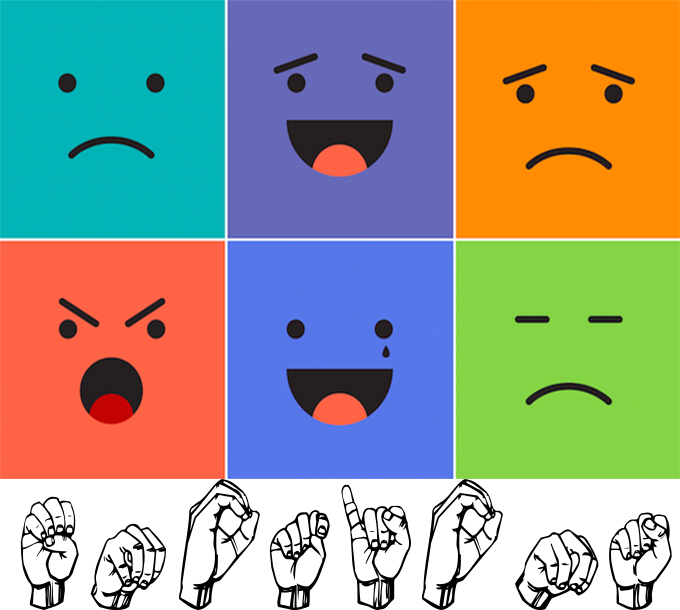 Learning the signs for emotions is also a great way to practice NMM (Non-Manual Markers) and facial expressions. * If you can’t get the expression matching the emotion your point is lost. At the same time, over-exaggerating a facial expression just makes it comical and loses validity. Practice in front of a mirror to see how much expression you are emoting and see if it matches the emotion you are signing. * Watch various YouTube videos (search ASL Emotions) and watch the signer’s face and body language as they sign the different emotions. (You might learn variations too). After watching the video try to copy the signer and see how closely you match them. * For additional practice on facial expressions, work with a partner and do the NMM without the sign and see if your partner can guess the emotion. To add more ASL practice have your partner sign what emotion you are using. * With a partner, practice opposites. You can do this with signs and facial expressions. For example, one person will sign happy, the other will sign sad. Or, one person will practice showing the facial expression silly, the other will practice showing serious. – What is your pet peeve (ANNOY/BOTHER)? Why? – Are you afraid of anything? Animal? Person? – When was an embarrassing moment? – When are you happiest? Where? – What class are you bored in? – Tell me about a time you felt nervous. Worried. Excited. – What topic confuses you? – What kind of people frustrate you? – What is the bravest thing you have done? – What are you proud of? – What makes you laugh? – What makes you sad? Angry, Annoyed, Afraid, Brave, Bored, Confused, Embarrassed, Excited, Funny, Frustrated, Happy, Hurt, Humble, Jealous, Like, Lonely, Love, Lazy, Mad, Mean, Mischievous, Nice, Nervous, Proud, Quiet, Relaxed, Sad, Surprised, Silly, Serious, Stupid, Shy, Stubborn, Tired, Worried.